Solid second pick in HaupsCube. The set was called Edge of the World. It was the only set to ever be acknowledged by WotC without being created by them. Now, releasing a 3rd party set came with some preconditions. The mana symbols - as well as the card backs - were intellectual property after all. So to appease the powers that be, the cards were made as black/white "stickers" you could adhese to an existing Magic card. 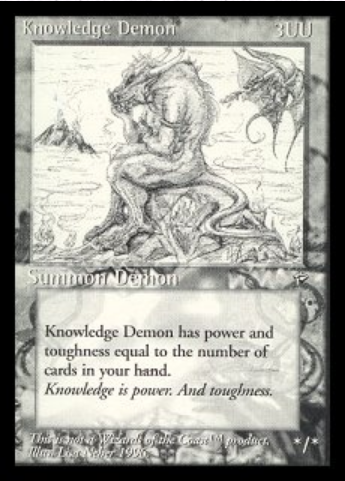 Rather than using mana symbols, the cards used their one-letter shorthand. 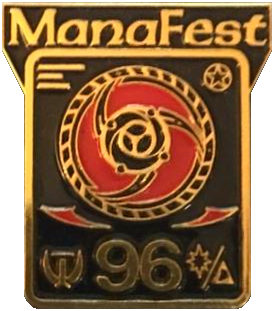 And the cards were not allowed to be sold or distributed in randomized boosters, so to get your hands on them you pretty much had to be at ManaFest 1996 and receive them through some event there. Singles were distributed at the organizers' discretion; as prizes for winning, losing, or simply participating in various tournaments. 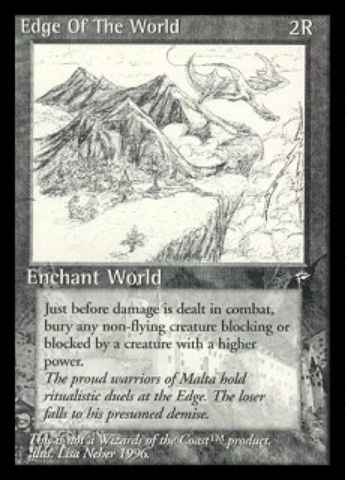 Edge of the World contained a total of 90 cards, similar in size to the early expansions. The print run is estimated to have been around 60 sets total. This relatively minor run combined with the fact that most cards were used and glued onto existing cards during that first event at ManaFest makes unused stickers (or stickered cards for that matter) something of a rarity today. At the time of the convention in 1996, four complete sets existed; two belonging to the executive producers of ManaFest, one to a producer of ManaFest, and one to the creator of the set. Two of these sets have since been passed on to other collectors. Edge of the World sticker back. The design and power level of Edge of the World is varied, as most set were back then. Among the more interesting designs is the first "Maro" (a creature with power and toughness equal to the number of cards in a player's hand). In fact, a handful of the mechanics and flavor texts used in Edge of the World were later used for fully official cards. Possibly by chance, perhaps by inspiration. My personal white whale from this set was a card called Chaos Beast. I have a project of sorts trying to collect as many cards related to Chaos Orb as possible, and a subset of that project was to collect every card that had "Chaos" in the title and "flip" in the text. Game of Chaos, Planar Chaos, and the likes. This was easy for all cards except Chaos Beast, which, on the contrary, was hard. It feels nice to finally add it to the scrap book. The Edge of the World set tells a unique story of a very different time in Magic and of the information era at large. A time when a thing like this could actually be approved by WotC, and when an "approved set" could fly under the radar for almost all players. If nothing else, it tells of an impressive achievement by dedicated fans during the budding years of the game. I had never ever heard of this! I checked the date of the post twice, just to make sure it wasn't April fools... Thank you for this.